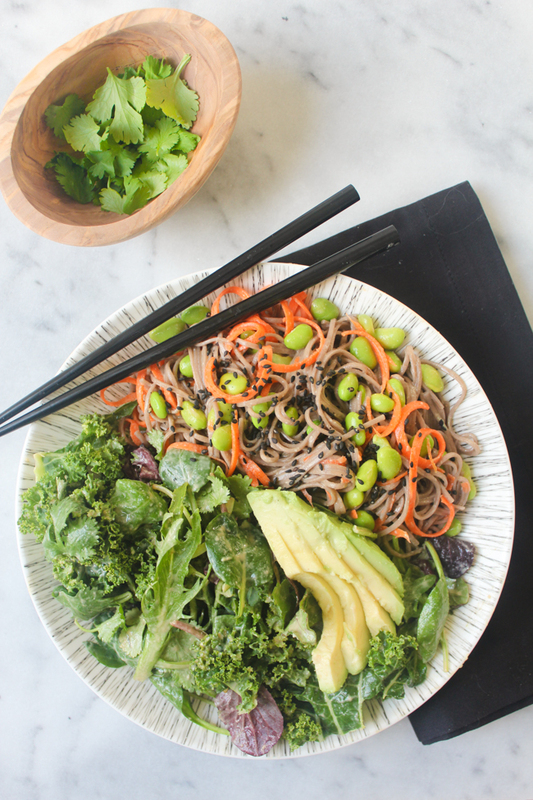 So excited to ring in 2016 with this deliciously beautiful soba salad! 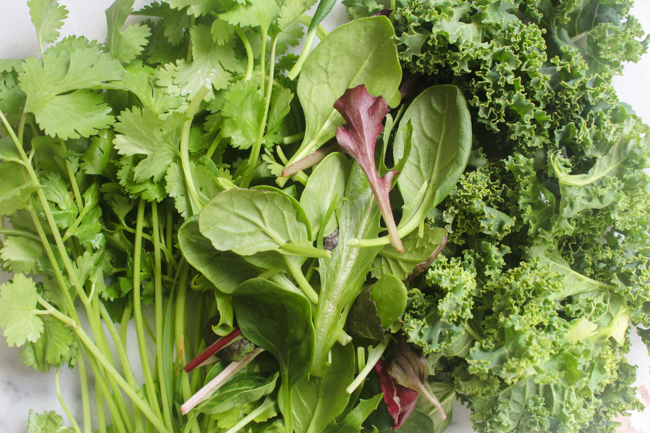 The mix of flavors and textures in this salad is just amazing. 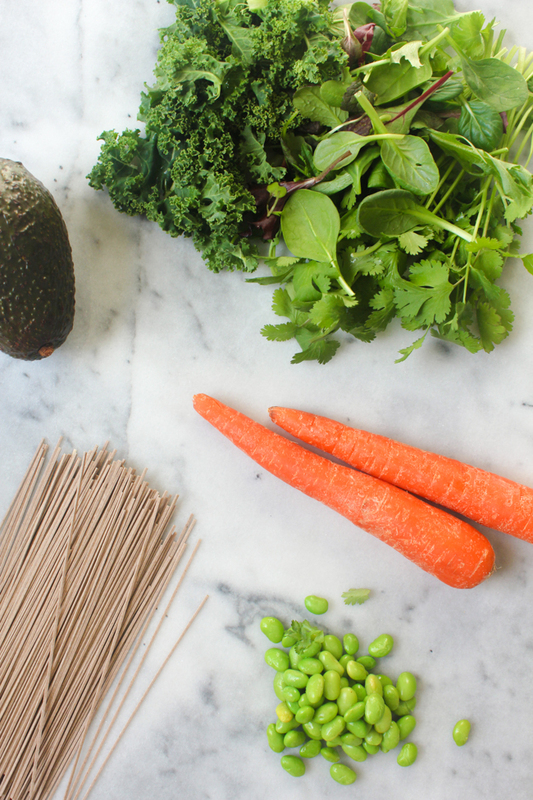 The kale and cilantro provide a fresh crispness, the carrot and edamame add the perfect crunch, and the earthy soba noodles bring all the elements together. Everything's tossed in a miso tahini dressing that gives each bite a creamy tang and then adding the rich, velvety avocado just takes it to a whole other level. Have you ever heard someone say, "Bacon makes everything better?" Yeah...no thanks, how about "Avocado makes everything better?" YES. That's more like it. Not only is this rainbow salad beautiful and delicious, but it has such a wide variety of healthy vitamins and minerals as well. 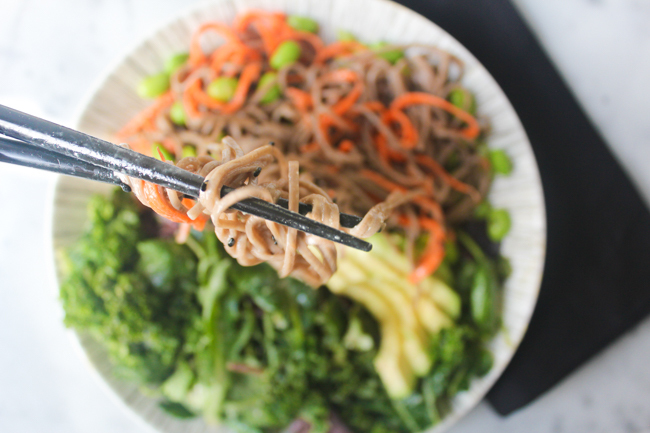 Soba noodles provide lean protein and magnesium, which aids in energy metabolism and promotes a healthy nervous system. Avocado has 20 different vitamins and minerals, and is loaded with fiber and essential heart-healthy fats. 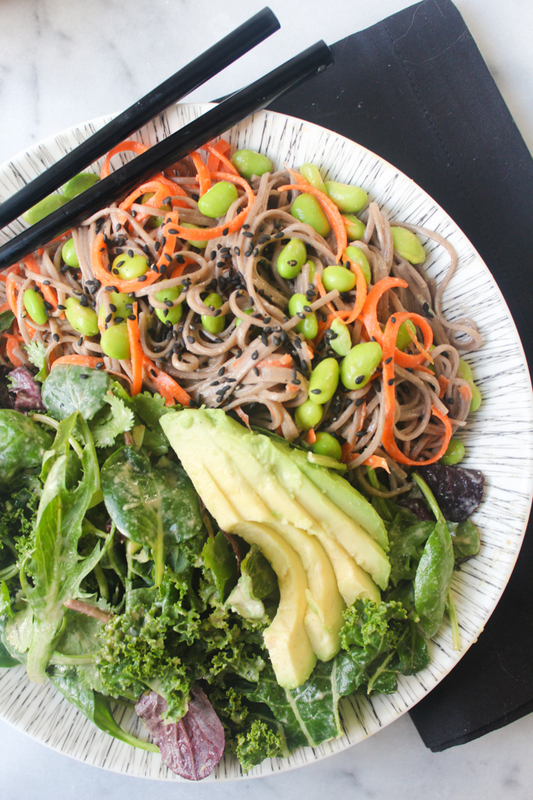 Edamame is high in fiber, protein, and iron; and it's no secret that kale is among the most nutrient dense foods on the planet, being packed with antioxidants. 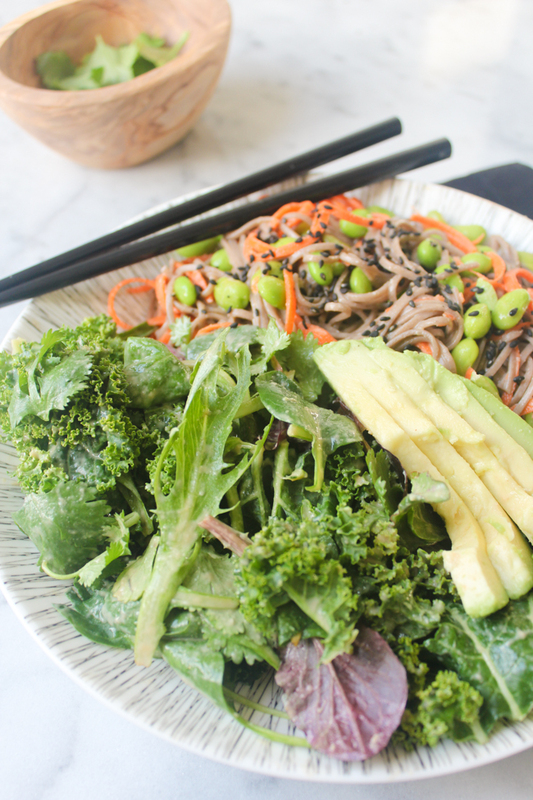 Tahini and miso are two more superfoods that you can read about in this post for a kale and sweet potato salad with orange tahini dressing and this post for a healing miso soba noodle soup. All those yummy, healthy ingredients and still this recipe is so simple, it only takes about 15 minutes. It's also the perfect on-the-go lunch because it transports wonderfully well in a mason jar and, if you use only kale instead of the lettuce mix, it won't be soggy by noon if dressed in the morning. It's also perfectly in keeping with resolutions to eat delicious food that's kinder to your body and the planet. Happy New Year everyone! - Bring a large pot of water to a boil and cook the soba noodles according to the package directions (about 3 minutes). Drain, rinse with cold water, and set aside. - To make the dressing, combine all ingredients in a small bowl. Mix thoroughly. - Assemble the salad by tossing all ingredients in the dressing and garnishing with sesame seeds.